A man departs for the US-Mexican border and vanishes before reaching his destination: Amarillo, Texas. Through stunning projected images, bilingual monologues and a sea of displaced objects and natural elements, this renowned company reconstructs his journey in a multimedia performance that travels imagined landscapes of both geography and cultural identity. The absent man takes on multiple faces and names as he comes to symbolize the thousands of disillusioned travelers who have suffered a similar fate. Amarillo touches on the complex nature of individual and national identity in a time of exodus—both for those who leave and those who are left behind. The group Teatro Línea de Sombra under the direction of Jorge A. Vargas and Alicia Laguna and belongs to a new generation of independent Mexican theatermakers, who have managed to establish themselves beyond the state theater system in their country and to also have a presence on the international scene. The company was founded in 1993 by actors, directors, and set designers. They work in cross-genres and develop their pieces in collective creative processes. 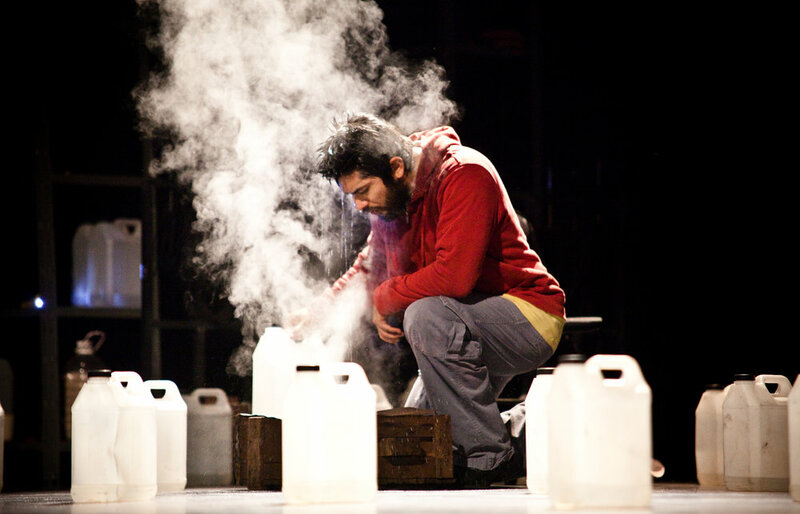 In most of their works Teatro Línea de Sombra deals in a critical manner with the social and political reality in Mexico. The group participates in the organization of the TRANSVERSALES festival, which takes place every year in alternating cities in Mexico and has the goals of offering a platform for contemporary Mexican theater and of creating interconnections with artists from other nations. The ensemble members of TLS are rooted in political theater and collaborative process. Their projects are characteristically modular and use visceral imagery, evocative soundscapes and semi-autobiographical fictional writing. In decades past, many important border plays opted for realistic or documentary approaches in pursuit of the universal. TLS has shaped a new dramaturgy that deploys highly visual method and casts attention on the untold and varied effects on the individual involved in migration restrictions and detainments.